Luke 7:1–10: A centurion, well-spoken of by the Jews, sends servants to Jesus to ask him to come to his house. Acts 10: A centurion, well-spoken of by the Jewish people, sends men to Peter, asking him to come to his house. Luke 7:11–17: Here we have a narrative which involves a widow and a resurrection. Jesus raises the dead, saying, “Arise.” Upon doing this we read that the dead man "sat up". Luke 7:36-50: Jesus is criticized by a Pharisee for being touched by a sinful woman. Acts 11:10–13: The circumcision party criticizes Jesus for his association with Gentiles. Luke 9:51-19:28: Jesus journeys to Jerusalem, which is ultimately to end with his passion (9:31; 9:51; 12:50; 13:33; 18:31-33), doing so under divine necessity (13:33). Throughout the journey the disciples’ lack of understanding is underscored (14:45; 18:34). Acts 19:21-21:17: Paul journeys to Jerusalem, also a kind of “passion-journey” (20:3; 20:22-24; 20:37-38; 21:4; 21:10-11; 21:13), which he undertakes under divine necessity (20:22; 21:14). The trip is marked by his friends’ lack of understanding (21:4, 21:12-13). In fact, the similarities between Jesus and Paul can be further underscored: For example, in the “way” narrative of Jesus’ trip to Jerusalem, there are seven references to journeys to Jerusalem. Of course, like Jesus, Paul makes a journey to Jerusalem in the book of Acts. Not surprisingly, there are seven important references to this journey. 2. Luke 13:22: “. . . [Jesus] was journeying toward Jerusalem. Acts 21:11-12: Agabus tells Paul that the Jews at Jerusalem would bind him. Finally, as Talbert observes, not only is the journey to Jerusalem similar. There are further parallels in the details of what happens to Jesus and Paul in the city. These similarities are too uncanny to be written off as coincidence or insignificant. Luke 19:3: Jesus is welcomed by the people at Jerusalem, who praise God for his works. Acts 21:17–20a: Paul is welcomed and they glorify God for the things being done through him. Luke 19:45–48: Jesus goes into the Temple. Acts 21:26: Paul goes into the temple. Luke 20:27–39: The Sadducees, who do not believe in the resurrection, oppose Jesus. Some scribes take a friendly attitude to Jesus. Acts 23:6–9: The Sadducees do not believe in the resurrection oppose Paul. 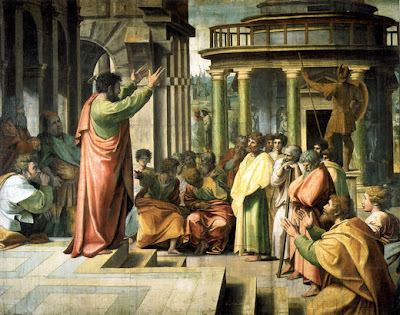 Some scribes say they find nothing wrong with Paul’s teaching. Luke 22:54: A crowd seizes Jesus. Acts 21:30: The people ran together; they seized Paul. Luke 22:63–64: Jesus is slapped by the priest’s assistants. Acts 23:2: Paul is slapped at the high priest’s command. Luke 22:54; 23:1; 23:9; Luke 23:11: The four trials of Jesus (the high priest and the council; Pilate; Herod; Pilate). Acts 23; 24; 25; 26: The four trials of Paul (Sanhedrin; Felix; Festus; Agrippa). Luke 23:4, 14, 22: Pilate declares Jesus innocent three times. Acts 23:9; 25:25; 26:31 Three times the pagan rulers (the king, the governor and Bernice; Festus; and Agrippa) declare Paul innocent. Luke 23:6-12: Pilate sends Jesus to Herod for questioning. Acts 25:13-26:32: Herod hears Paul with permission of Festus. Luke 23:16, 22: Pilate says he will release Jesus. Acts 26:32: Agrippa says: "This man could have been set free"